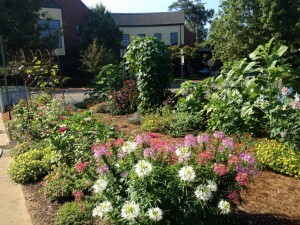 Our Flower Garden – Look How It’s Grown! 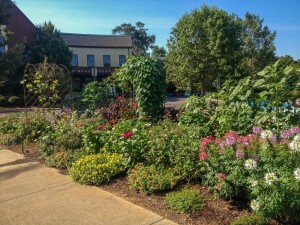 Our “Better Late Than Never” flower garden, planted in late June, is proving that any time is the right time to plant a garden! The response from the community has been quite gratifying as well. For all of us who plant a garden, it’s also exciting to see how quickly plants grow. One morning the sunflowers are just beginning to come up on wobbly, thin stems, and then, almost overnight it seems, they’re over 5′ tall and reaching for the sun. Zinnias, those stalwarts of any sunny, summer garden, have been the stars so far, and we keep planting more. The tall purple and pink gomphrena, cigar plant, peach porter weed, gloriosa daisies, tithonia, milkweed, cleome, and, of course, the sunflowers aren’t far behind in star power though. 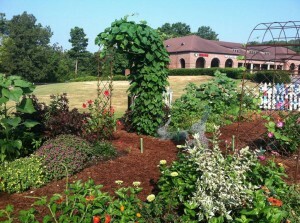 A garden changes daily, and this one is no exception! The honeybees have found it too. Each morning the large, colorful patches of the low-growing, succulent purslane are host to hundreds of them. There’s no need to be frightened; they’re just going about their business, pollinating and returning to their hives each day. The sunflowers are beginning to show off now. And, like gluttons needing more food, we’ve planted another group of them around the very perimeter of the garden. This way, we reason, when the first of them have finally played themselves out, there will be more to look forward to. Yes, that is why we garden; isn’t it? Planting, tending, and watering aren’t chores when the end result is so gratifying, and we know the next day will bring something new in bloom. Sure, not everything works out. Some of the zinnias didn’t make it, the moonvine seems to be all leaves, the hyacinth bean vine is chewed to bits; but we filled in where the zinnias pooped out, the moonvine leaves are a beautiful green, and, after a few doses of Haven Brand Natural Moo Poo Tea, the hyacinth bean vine is coming along. A parting thought…Anyone can plant a garden. It can be as small as a few pots of marigolds this fall or as big as you want it to be. There will be great successes and, yes, some failures too; but that’s true of anything in life. Cliché as it sounds, the greatest pleasure is the joy it brings others…and that is priceless. This entry was posted in community garden, Flowers, Summer and tagged asclepias curassavica, authentic haven brand moo poo tea, better late than never garden, cleome, cutting zinnias, gomphrena, milkweed, oak street garden shop flower garden, porterweed, purslane, spiderflower, sunflowers, tithonia on August 23, 2014 by Kris Blevons.